Heat the oven to 400°F. Place a paper baking cup in each of 12 regular-size muffin cups, or spray just the bottoms of the cups with cooking spray. Place cereal in a resealable food-storage plastic bag; seal the bag. Roll over cereal with a rolling pin or bottle, or press with bottom of small saucepan, to crush cereal into fine crumbs. In a medium bowl, stir the crushed cereal, milk, raisins and vanilla until well mixed. Let stand about 5 minutes or until cereal has softened. Beat in the oil and egg with a fork. In another medium bowl, stir the flour, brown sugar, baking powder, salt and cinnamon until well mixed. Stir flour mixture into cereal mixture just until flour is moistened (batter will be lumpy). Spoon the batter into the cups, dividing batter evenly. Bake 20 to 25 minutes or until a toothpick inserted in the center comes out clean. 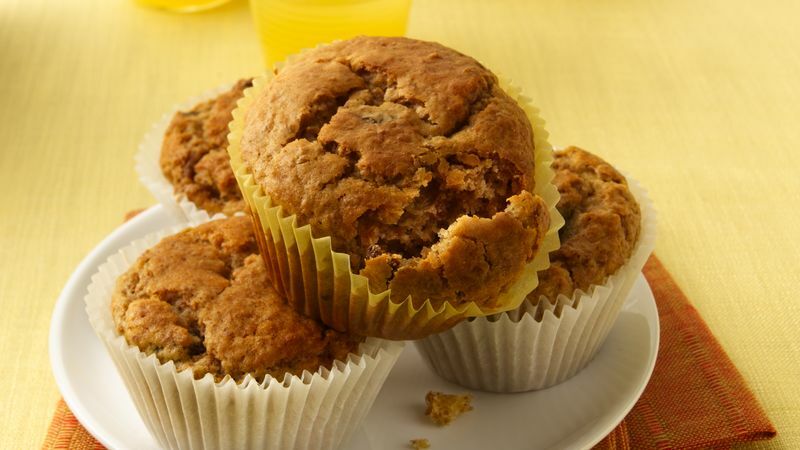 If muffins were baked in paper baking cups, immediately remove from pan to a cooling rack. If muffins were baked in a sprayed pan, leave in pan about 5 minutes, then remove from pan to a cooling rack. Serve warm if desired. Stir in 1 cup chopped dates with the flour mixture in step 4. Let the crushed cereal mixture stand about 5 minutes or until the cereal is softened and most of the milk is absorbed.